Parts of the iconic Highway 12 through the Outer Banks of North Carolina need to be replaced after Hurricane Matthew. Just like parts that needed to be replaced from the previous storm, and the one before that. When coastal geologists tell you this is going to keep happening (in case the stark reality of it is not enough for you) – why wouldn’t you move this road? The Virginia Pilot’s Jeff Hampton talks about the cost of it all in this article. One of the winners of the Rebuild-by-Design competition is a plan to protect the South Shore of Staten Island with reefs of oysters. Full story, map and diagram here. Oysters used to be abundant in NY and NJ waters and the oyster industry literally built many of the cities in the region. 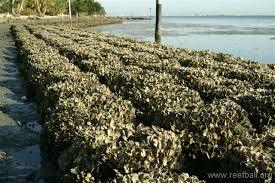 Oysters provide an additional benefit of filtering the water they live in, thereby cleaning it. Unfortunately, pollution and runoff exceeded the oysters’ ability to clean the water in which they lived, and oysters and their reefs died off. …is heading towards Mexico’s Pacific coast. Hurricane Patricia has sustained winds of 200 miles per hour. Unfortunately, this storm will put all previous storms to shame. Thankfully, the population is sparse in this area, so loss of life and property will be much less than if this hit somewhere else. The point here is to not look backwards, it has never served us well. Don’t think that it can’t happen, or it can’t happen here. It can, and we should prepare for such storms. What previous generations thought could never happen, happened like with Issac’s Storm. The biggest and best set of dunes in NJ just got bigger and better thanks to the recent Nor’easter. No federal agency was involved, nor were any taxpayer dollars, and there was no messy legal fuss involving easements or eminent domain. Great article and pictures here. This same set of dunes was already on Rethink after Sandy, with a 5 minute video linked to this post. Hurricane Joaquin will be staying out to sea, not making landfall. But we are experiencing a coastal storm right now, a Nor’ Easter. This is a garden variety Nor’ Easter; we get one like this every year, maybe a couple times a year. 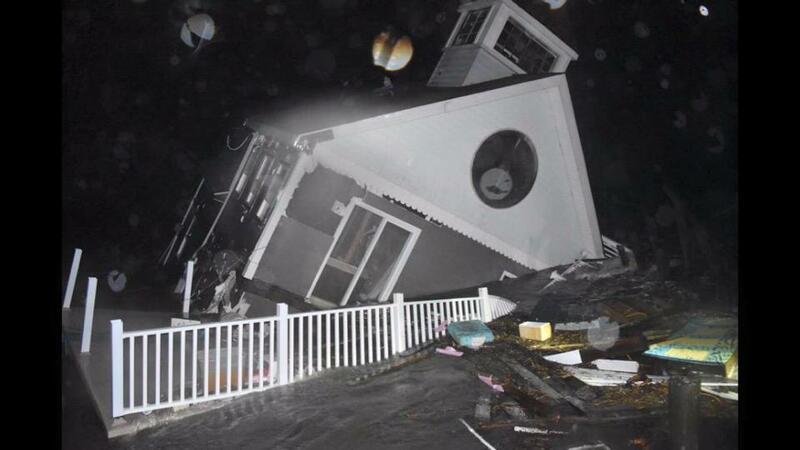 But this one has washed away a home in the Grassy Sound section of Wildwood, NJ. Read all about it in the Press of Atlantic City story here. All the sand in the world on the beaches of Wildwood would not make the least bit of difference to these folks. The same can be said for all of NJ’s 127 miles of beach. We’ve been on vacation here at Rethink the Jersey Shore, on a barrier island. 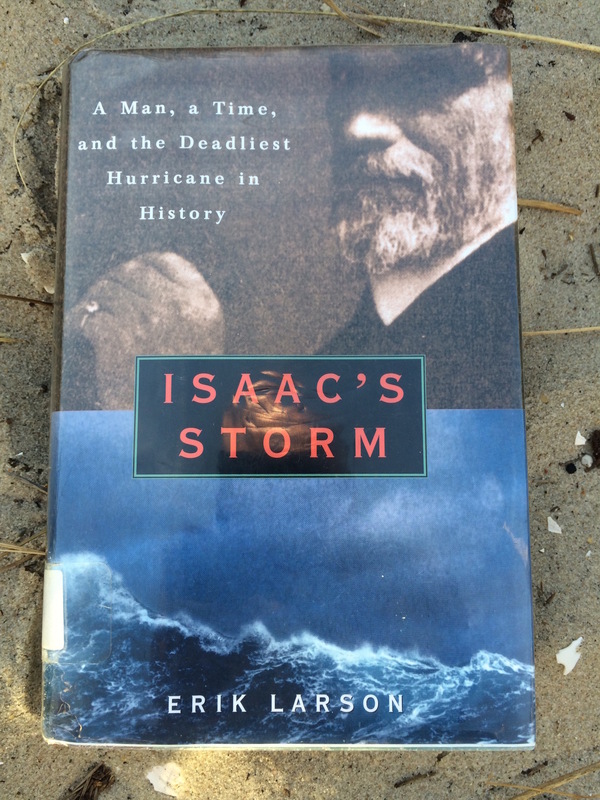 It is hurricane season after all so the summer reading included Issac’s Storm by Erick Larson. We could barely put it down. It’s about the hurricane that struck Galveston, TX in 1900; the incredible hubris of forecasters and residents alike, and the incredible devastation that followed. Of course people will say that could never happen these days. But that’s what they said back then. Looking backwards at what has happened before and preparing for that has never served us well. Imagination of how bad it could be, and preparing for such a scenario is the best course of action. In this case, a glance back helps prepare the imagination. The big news this week was that the Transportation Security Administration, TSA, failed 95% of tests where undercover agents brought weapons, fake bomb parts and contraband through airport security screening. Why is a website dedicated to coastal resilience telling you this? It is because we hope to avoid the coastal equivalent of Security Theater. Security Theater are the activities that look good to the untrained eye; full body scanners, people taking their shoes off, etc., that do not really keep us safer. We are wondering if there is a coastal equivalent – if there are things that “look good” but that don’t really protect the vast majority of us. A better question might be what is the most efficient? 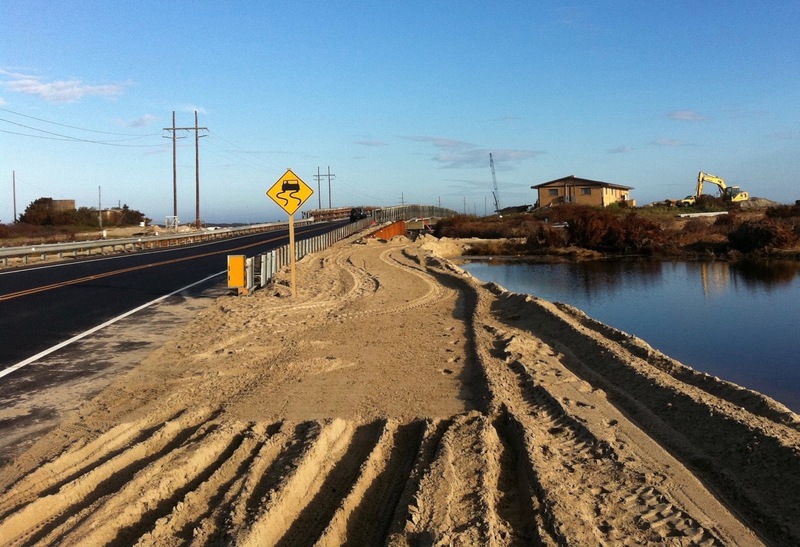 What measures provides the most protection for the coastal resiliency dollar. We definitely can’t send fake hurricanes up the coast to test this. 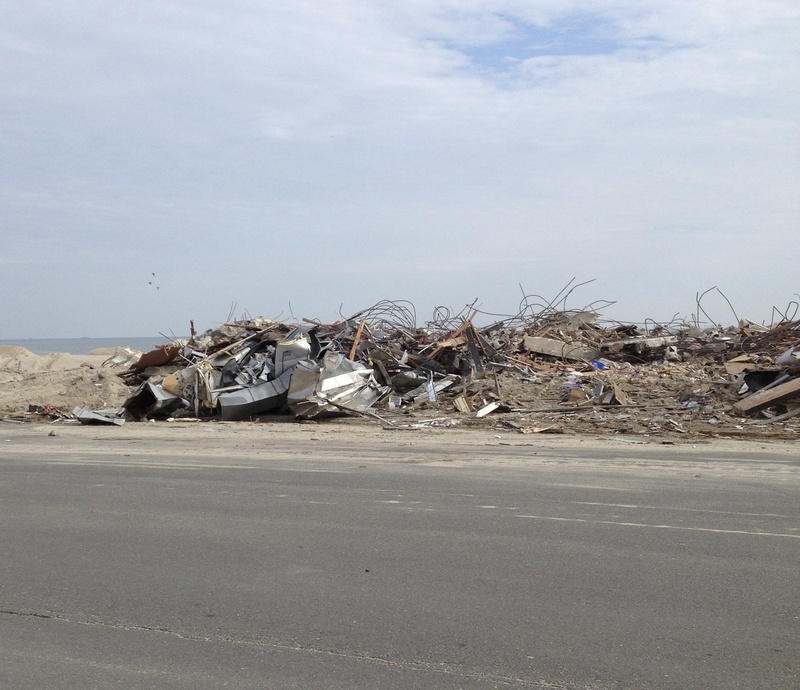 Our guess is that beach replenishment is in the category of things that look really good to the untrained eye. But upon closer inspection, it takes a massive amount of resources, but delivers most of the benefits to a very small number of people; the owners oceanfront line of houses. Even then the protection is mostly from wave attack, and this is only when massive dunes are built. We have plenty of evidence that beaches replenished with no dunes provided little protection from Sandy. So even with replenishment, everyone behind the oceanfront line of houses on barrier islands is still subject to regular flooding and inundation, and everyone on the mainland lining the bay is vulnerable still. No amount of sand on any ocean-side beach will protect those on the other side of the island or the other side of the Bay. This is why we need more Rethinking. 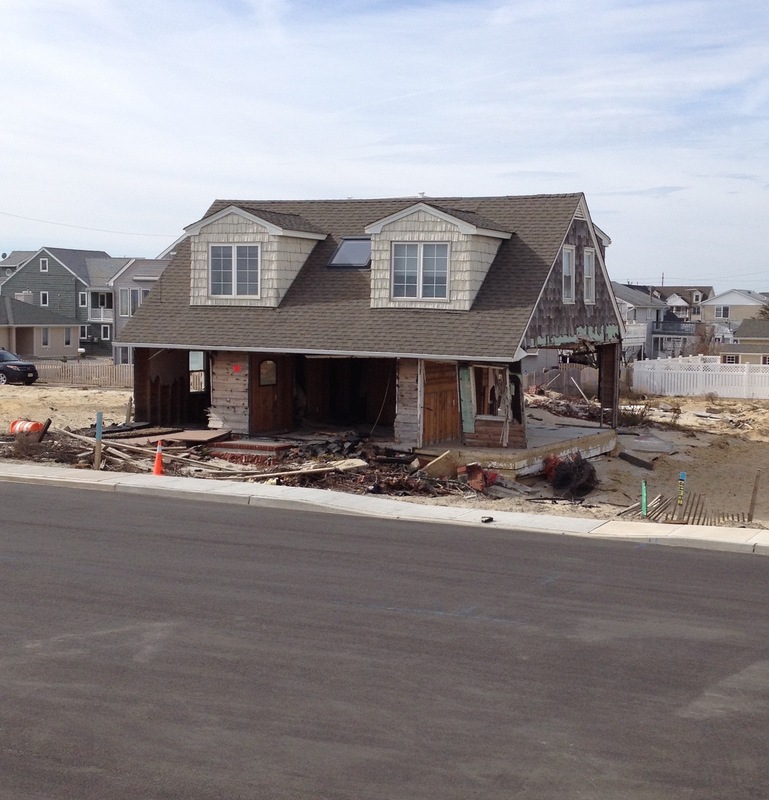 If you believe we will just rebuild (again) after the next Sandy, listen to these three stories of people getting government aid to rebuild by Scott Gurian of NJ Public Radio and NJ Spotlight. The process of dishing out government aid and rebuilding is so messy, so inefficient, and so fraught with pitfalls that we should Rethink at every opportunity and get these homes out of harms way. Given the choice, do you think these people would have taken a government buyout of their property before the storm? Or the living hell they are going through now trying to Rebuild afterwards? 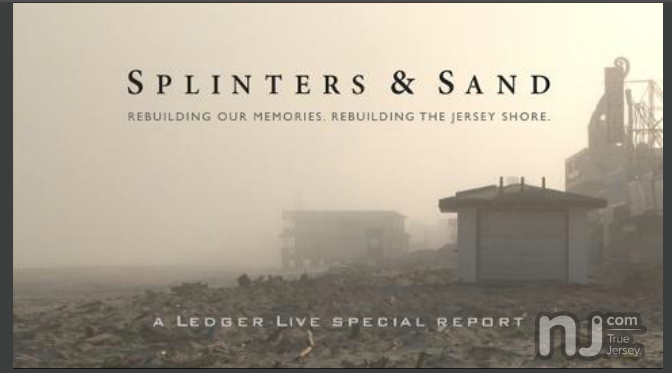 We highly recommend the 20 minute video from Ledger Live called Splinters and Sand made 3 months after Sandy. If you have not seen it yet, the link is in this post. The makers of the video revisited the people and places around the two year anniversary of Sandy. It is a slide show on their path back and where they are now. Very good follow up by the Star Ledger team. 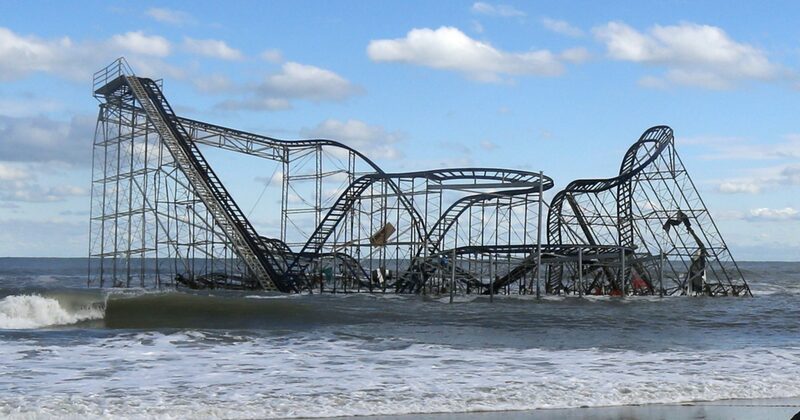 We continue with Sandy anniversary themed posts because for many, the indelible memories came three weeks or so after landfall. This was the first time that volunteers were allowed into certain places to start the cleanup, that (summer) homeowners were allowed on to barrier islands, and for some when they got their electricity back; although some islands had no gas, water or power for weeks more. 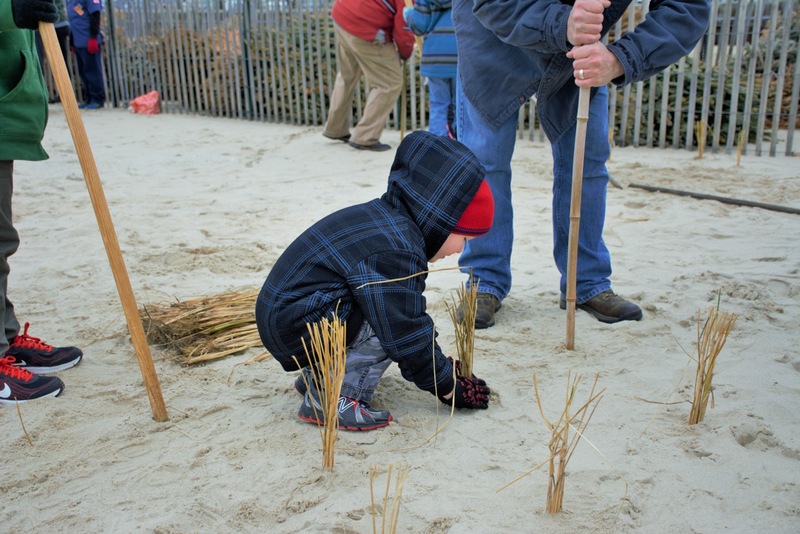 Splinters and Sand is a Ledger-Live video by Brian Donohue of NJ’s Star Ledger was made three months after Sandy. It gets to the heart of why we rebuild by exploring the charm of the Jersey Shore and the spell that is casts on all of us. This is why rethinking the Jersey Shore will be hard, but we firmly believe these two ideas are not incompatible. We can love this place and have our children and grandchildren love it while we make it safer and more resilient to the sea level rise and stronger storms that we know are coming.